It should be a smooth experience for your guests to get from their car to their room when they enter your lobby. Be the epitome of hospitality when you start and finish right, with Bellman Carts and Bellman Hand Trucks that make it so guests won�t need to lift a finger. Let the vacation begin right away and let guests know that they will be taken care of from the moment they step through your doors. 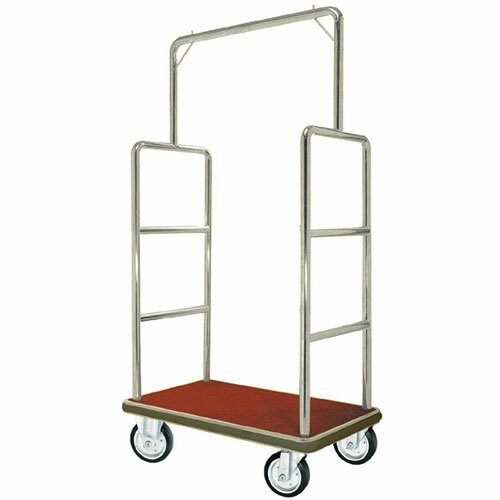 Baggage Carts with hanging rods make it easy to take a load off guests� shoulders and make it easy for your employees to make them feel comfortable. Hotel luggage racks and four wheeled bellman carts do all the heavy lifting and keep luggage from getting damaged or dirty. Not only will guests love the hospitable treatment they receive, your employees will appreciate the assistance that hotel luggage carts give them. These Hotel Luggage Carts come with or without carpet and come in chrome or brass finish. Bellman�s Hand Trucks work well for heavy baggage. For larger deliveries, check out our other Moving Equipment, like Hand Trucks and Dollies. Check out all of our Hospitality and Hotel items to give guests and employees a better experience in your establishment.